If the US secret services got possession of the MH-370 jet, then it was a child’s play for them to set it up for a false flag operation suiting their needs. 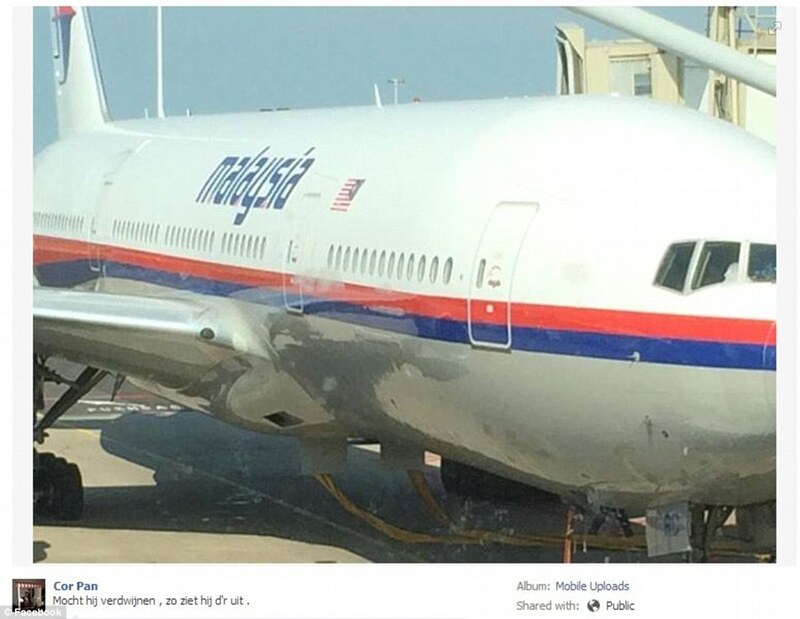 Unfortunately for those who staged the false flag event, the MH17 plane had an extra window (below) next to the second right-side door, which MH370 did not — and neither did the wreckage of the airplane! The conclusion is obvious: the wreckage most probably belongs to the ‘lost’ flight MH370. According to the Daily Mail, Flight MH-17 was photographed by one of the passengers just before boarding, but the identification number doesn’t macth! #4 Update [07.27.14]: Forbidden in the government controlled media, is mention that a SECOND aircraft was nearly on top of Malaysian flight 17 when it was supposedly shot down by a Ukranian missile in separatist hands. Who was in it? Why were they there? Why won’t anyone talk about it, or question the pilots? A clue may be found in the real-life Operation Northwoods – a declassified top-secret plan devised by the US military, to instigate and “justify” a war with Cuba. Much of Northwoods involved staged ‘shootdowns’ of military and civilian aircraft, and faking crashes. “An aircraft at [US military base] would be painted and numbered as an exact duplicate for a civilian registered aircraft. When over [the target area] the drone will begin transmitting on the international distress frequency a ‘MAY DAY’ message stating he is under attack by [the chosen enemy]. The transmission will be interrupted by destruction of the aircraft which will be triggered by radio signal. … a pre-briefed pilot would fly tail-end Charley at considerable interval between aircraft. Efron thought police stazi run this site!!!!!!! I’ll tell you what……you send this article to VeteransToday.com editorial staff, people who are intel specialists. If they agree with I I’ll believe your story. If they say you are full of s**t, it will confirm what I find here at this website far too often! especially when the “Christian” females post their dramatic BS crap. Having lived through so many cover-ups in the last half century, I find this theory quite plausible. The fact that maniacs want a conflagration with Russia on the 100th anniversary of WWI is quite ominous, I might say, of Black Magic. The Republicans with their three reversed pentagrams are certainly a party of Evil. There is for sure a conspiracy behind this crash but it’s well the MH17 9M- MRD that crashed. For the Flight Radar-24 screen capture that shows MH-17 as “canceled” on the date of the crash, I think it was because they don’t have any “crash box” to select and are obliged to put it into “cancelation box”. But there is for sure a conspiracy behind this crash, the video made before the crash and released the 18th is a proof… The thing with those passports is also abnormal. 63Marine: Ah, yes……..the perverbial search for truth. It is almost nonexistent in the last 50 years! Those of us that have awaken to the hidden truths and continue to seek them, have this giant problem of finding it further. Every day, all day long, we are bombarded with lies and propaganda. When are people going to realize that MH-17 was NOT a Boeing 777!!! If you look at the engines at the crash site, the air intake blades are small, maybe 4-5 feet diameter max. like a 707 or DC-8. If you google Boeing 777 engine size, you will see that the air intake of a 777 engine is almost 10′ in diameter. Don’t buy into the BS that the governments are feeding you. We all need to see the real truth behind all of this….. If this story is true, and the bodies are from the first 370 flight, how do the people working on these bodies keep quiet? I mean, if they are getting different bodies then they must be in on it, but that leads me to the next question, what about the passengers that left Amsterdam that day? You don’t mention anything about this in detail just curious.